The expansive world of The Legend of Zelda: the breath of the wild features a diegetic economic system. From time to time Link meets travelling merchants or visits shops in villages and can buy or sell food, plants, weaponry, minerals and so on, resources that are distributed across the world and foraged for or won in battle. However this trade is little more than barter, rudimentary even for the game’s pseudo-medieval setting, with no real latitude for significant accumulation and no visible effect on the world’s social organisation – unlike the dynamic growth and entropy of SimCity, Hyrule is a fundamentally static world. However, these natural resources and artefacts do have a vital role to play in Link’s day-by-day and moment-by-moment progression through, and survival in, the world. Foraged plants and meat can be eaten to restore health or temporarily boost stamina for climbing rock faces or surviving conditions of extreme cold or heat. Importantly this ostensibly realist dimension is fundamentally abstract and economic. 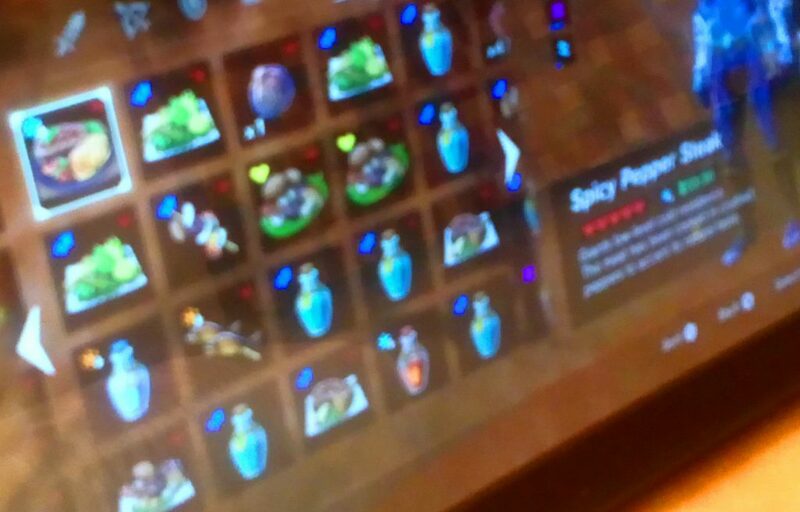 On the inventory food items are depicted, to use Peircean terms, both as icons – for example a picture of a meat and mushroom skewer, and as symbols – with a stylised heart (for health restoration), upward-pointing lightning-strike arrow (for speed boost) and so on. The fictive food is strictly quantified and valued and held in reserve for exchange and expenditure through the avatar’s activities and affordances in the game’s world. This is clearly evident when, for example, Link is climbing a particularly high cliff. The economics of stamina are depicted indexically through an inexorably shrinking green wheel floating above his head, a wheel that can be briefly replenished through the consumption of the appropriate stored resources. Flipping through the inventory (impossibly large for the character to carry in the diegetic world) as Link clings precariously to the cliff, the player is not concerned about whether to have him eat, say, a fish kebab or sautéed mushrooms, their only concern is for the wheel symbol and its quantitative value.